I could look it up...but, what was your fuel tank capacity or more importantly "range" per tank? The F150 we rented had Sync 3. We all really enjoyed using Apple Car Play and Android Auto for playing music, navigating and even making calls. The F150 we rented had frontal pre-collision detection but not pre-collision avoidance. So, if the truck thinks you're going to rear-end someone, it will alert you but will not brake for you. I floored the truck to pass a car on a two-lane highway, and the pre-collision alarm activated. I think it's useful, and might prevent a crash, but not as well as if it would brake before a collision is inevitable. This is where the Tacoma shines. 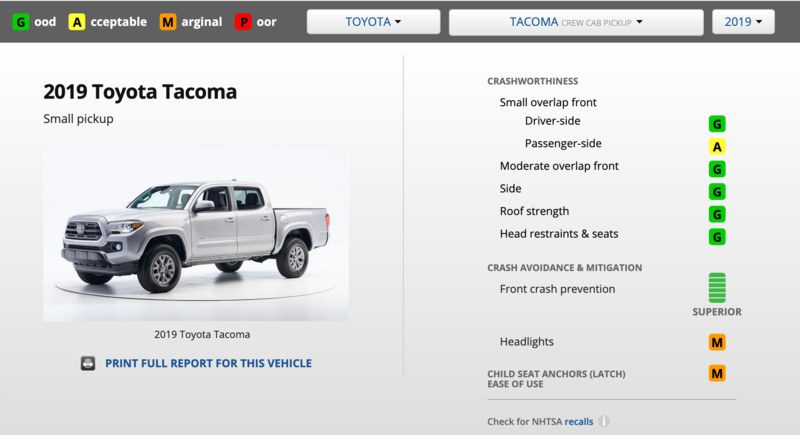 The Tacoma comes standard with pre-collision avoidance, so it'll break for you too. 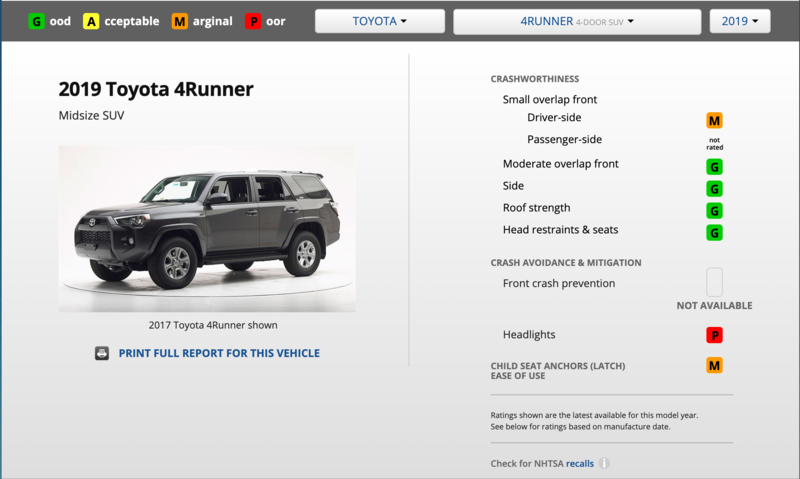 No front crash prevention is available in the 4Runner and Jeep Wrangler. 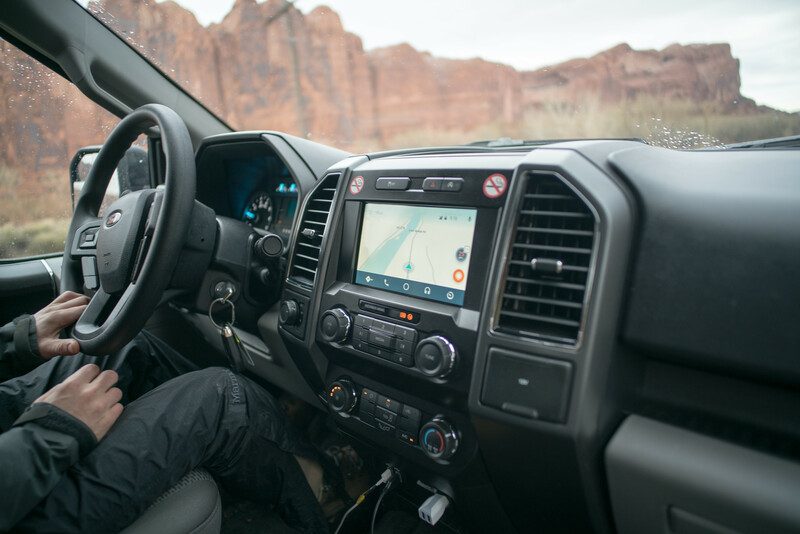 The F150 comes standard with pre-collision detection, and in the higher trims, like the Limited, it comes with pre-collision avoidance. Ranger is an excellent option too, but I found it to be too small for my needs. It is an awesome truck all around, especially for parking. The biggest downside of the F150 is parking. The turning radius is much poorer than I anticipated, so it makes parking the 80-inch wide beast a pain. We had the short bed, the 5.5' box, and it was a long for a lot of parking spaces. Ideally I'd want the 6.5' box for more cargo area, but I can't imagine parking it. You can get a 360 degree pano camera as an option. My brother has one on his F350, and it makes parking a breeze. The backup cam alone isn't enough. They have two options: a standard 23 gallon and an extended range 36 gallon. The one we rented had the 23. I would love the extended range. 20.9 avg MPG * 36 gallon = 752.4 miles. Dang! I'd forgot it needs fuel! That would be so so nice for offroading adventures. No need for jerry cans. Many Cake users contributed to my search. Thank you! I ruled out great contenders like the Nissan Armada, @vegasphotog suggested, because of its high price tag. Man, such an excellent vehicle though. I limited my assessment to sub-$50k vehicles (though the F150 is pushing it, but used they are a good deal). 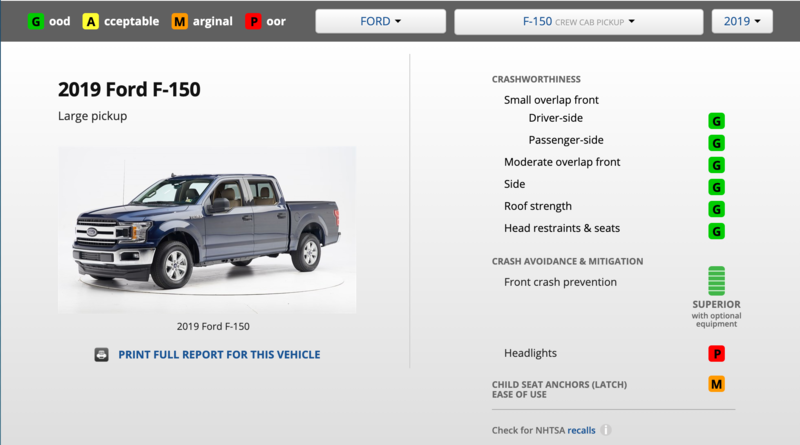 @bstrong's Ram 1500 suggestion also came out on top, but the F150 had a slight edge on it due to it's the light aluminum body and EcoBoost engine. @Pathfinder, an owner of the F150, inspired me to look very closely at the F150. My 2018 F150 4x4 SuperCrew came with the optional 36 gallon tank and I love it. I have the 3.5L Eco-Boost V6 Kevin used, and my milage per tank runs somewhere between 500-700miles - usually around 600+. depending on my speed, prevailing winds, how fast I'm travelling etc. I love having that kind of range; I can use GasBuddy to help me shop for cheaper gasoline along my route as I travel. I don't usually drain the tank dry until I'm running on the sand in the bottom of the tank, but usually begin to think about refueling at 3/8ths or less tank remaining - that is why I reported ranges less than 700+, even though at 60mph I am certain I can average 20mpg unless I am climbing up and gaining elevation. I typically get around 18-19mpg locally at 550 feet above sea level at 70-75mph on the highway, which is very similar to my 2015 4Runner, but my F-150 accelerates faster. Kevin - as to drawer system I have been looking at Decked.com very seriously - they offer a pair of roll out drawer for the 5.5 foot bed starting at $1249.99. I already have added an ARE bed cap ( https://www.4are.com/product/z/ ) - looks fine and keeps the rain out - don't know about desert dust yet. Not cheap though. I am still on the fence about bigger tires - I didn't lift my 4Runner and it has taken me some amazing places with the stock suspension and good AT tires - I ran Cooper AT3s for 40,000 miles with good success. While driving to Denver last January in heavy snowfall I began to feel my rear wheels break loose from the asphalt and slip ~15º sideways - countersteering brought that back under control, but switching to Wet Rain or Snow Drive Mode and it no longer occurred. Maybe the snow was lesser ( it was ) but I think it really helped. When I was drivng to Dallas in absolutely torrential rains in March ( the kind of rain one should really pull off the road for), I had no issues with hydroplaning in Wet Rain Snow Mode. So I am a fan of the transmission and the Drive Modes. Tow Haul will help you get off the line faster with a heavy load, and I expect it to offer better speeed control when descending mountain roads with a trailer as well. My truck came with Hankook DynaPro AT tires with a M+S ( mud and snow ) rating so that may have helped. They are quiet on the highway but seem adequate in the snow I encountered. You can also manually shift the transmission gear by gear with the +/- knob on the gear shift lever too. And the rear dif locks electrically in the FX4 package. In the boxes for the test results of the Wrangler, 4Runner, Tacoma, and the F150 I see the box for headlights for the F150, the 4Runner, and the Jeep are all marked Poor - Does this mean they fair poorly in a crash ( not very surprising ) or does it mean they don't light up the road very well? I do think that neither my 4Runner nor my F150 offer great lighting with their high beams at night - both have Halogen lighting systems. Compared to the HID lights I had on my BMW 3 series they are very weak candles especially the high beams - which I admit rarely get used these days to the traffic densities on interstate highways - but I am eagerly looking for better highbeams for my F150 and am looking for suggestions from any readers who know of better high beam headlights for the F150 (which is even worse than my 4Runner) . Did you happen to notice this in the desert with your rented F150? Or am I just a cranky driver? I am eagerly looking for better highbeams for my F150 and am looking for suggestions from any readers who know of better high beam headlights for the F150 (which is even worse than my 4Runner) . There are aftermarket quality (read --> $$$) bulb replacements including HID and LED versions. I think they are worth it for the safety factor they provide. I have run Phillips LEDs for few years now in my motorcycle and they are much better than the regular halogens, not to mention I haven't had one burn out yet, like the halogens do. I bought mine at Xenondepot. Baja Design is my go to place for auxiliary lights, they do it with real science research. Man, this conversation is having me totally lusting for a truck I don't really need right now.. okay maybe just a Ranger?! Xenondepot.com looks very interesting and like it has what I need for my F-150 and for 2013 F-350 as well. HID vehicle specific lighting kits and reasonably priced to boot! Thanks @Dracula - You're the MAN! I didn't know if I'd like the 10-speed transmission, but I hardly noticed it shifting on the highway. I did try various drive modes, but I didn't drive in enough conditions to test out Rain / Snow and Tow-Haul. The differences between Sport, ECO, and Normal were huge. The truck felt like a lead brick in ECO mode. It barely goes anywhere when you step on it. The Sport mode was the exact opposite. I turned Sport on when I was making unprotected turns. This truck we had did have auto start-stop. I didn't mind it. There was a 1 second-ish lag for the engine to start after turning off at a stop. I did turn it off when making unprotected left turns, because it did go off after creeping into an intersection. I almost exclusively used manual shifting when crawling in 4-LO. I found the 10-speed constantly shifting even though my speed was only changing by a couple of miles an hour at a time. I found the +/- knob to be really annoying ergonomically but got used to it after a couple of hours of driving on dirt. I thought paddle shifters on non-sports cars like my Outback are a gimmick, but this Ford made me miss them. We didn't need a locking diff on our trails, but it's definitely something I'd purchase if I buy an F150. My logic is: why buy a 4x4 with two open diffs? It's almost equivalent to a 2 wheel drive with one locker when wheels are slipping. Now it would be really cool if you could get lockers in both the front and back, but sadly they don't offer that. I like white vehicles. They're hugely helpful in keeping them cool on hot days. And I've seen data that light colored vehicles are safer because they are more visible (except in blizzards 🤪). Yeah, the decked drawer system looks really cool. My only criticism is that the design seems pretty bulky. There's a lot of structure that minimizes cargo space, but I couldn't design a better system. And still, one of those has more cargo room than most SUV's. My Subaru has the same clearance as the F150, 9ish", and I have some serious undercarriage damage. The FX4 has better undercarriage protection than the Subaru. Besides the diffs, the F150 seems like it has far more than 9" all around except for the front bumper skirt. I think the front bummer goes down low to improve fuel economy. I wonder if many people take it off. When I was shopping for a truck I could find Raptors and Chevy Colorado Z2Rs - always in candy apple red or black and I always laughed - I mean really, for desert use those are the least desired colors I could think of - they look great on new mall cruisers, when they are clean and polished, but after a few days in the desert backcountry its gonna take hours and hours to make them look new again. White, flat silver or deset tan just work so much better in the desert. White is much much cooler too, as you pointed out, and doesn't really show dirt that bad. I need a square foot magnetic sign to put on the doors of my truck that say "Authorized Vehicle". - authorized by me any way. The front bumper skirt is for air flow, there are also winglets in the grill and front of the truck to control air flow at highway speed also for fuel economy . I don't notice the start/stop to be an issue in normal driving - it kills the engine ( after it warms up ) when I first roll up to a stop at a light, but restarts immediately when my foot comes off the brake pedal. There is a defeat switch on the dash, and I would defeat it off road or in 4 Lo for sure. Tow Haul mode defeats too. The drawer system is nice because I can order it and have within a few days. Or one can build one out of lumber and plywood - I helped my older son build a drawer system for his 4Runner - but it does take several day to accomplish, and one really needs a table saw and a good set of hand tools to do it. And the wood and parts cost him about ( this is a guess not a fact ) $300-400 bucks - but he did use very nice 9ply finished birch plywood. But it comes in 5x5 foot squares so one has to be able to reduce that to size - My son knew I own a full size panel saw system..... which most folks don't have access too. I use Eco Mode on the highway sometimes on the interstate when I am cruising, but not in town - I just use Normal mode in town. One can get a very fancy interior in an F150 in a Lariat or Platinum version, but those are 10-20 grand more than my truck. It looks like the headlights are rated for crash prevention, i.e. lighting the road enough to help the diver avoid obstacles. I think it's a really hard problem for automakers to solve because the only cheaper solution is to blind other drivers, but that's against the law. I think the ideal systems is to have fancy lenses with adaptive controls, like turning the lights as the steering wheel turns. I did find the headlights were poor for lighting the unlit desert roads. Though, I found the auto highbeam setting to be responsive and useful on the two-lane highways. I think the cheapest solution is to buy high lumen LED non-DOT approved high beam bulbs, like 9000 lumen, and vow never to use them on near other cars. Otherwise, high output fog lights / light bar with good lenses is probably your best bet. The ranger raptor looks so epic! It is funny you mention steerable headlights - my BMW 3 series had them ( as do most current BMWs) , but I was looking at a 1928 Packard yesterday - and it had steerable headlights - cable actuated, but the lights turned with the steering wheel in 1928. I think I will order the LED lights for the high beams for my F350 first as I think they are worse than my F150. I have these for my Subaru, and they are pretty good. They were a pain to install because the coolers make it a tight fit. 6k lumen per bulb!